We slept really well and didn’t get up until 9:00 AM. We went to the hotel restaurant for breakfast. They had a nice buffet. We always start with cereal, preferable something with bran or high fiber. We missed seeing the “diet” table with the bran cereal. We will try again tomorrow. The buffet had scrambled eggs, bacon - kind of under cooked, sausage, huge mushrooms and pastries. When we went back to the table after finishing our cereal, and going to the buffet, we found the waiter had completely cleared our table. It was almost 10:00 and there was only one other couple there so I guess he was in a hurry to get out. So he reset the table. We went out to “test” the weather and decided that we needed to wear our jackets. It was a beautiful sunny day but a little breezy. 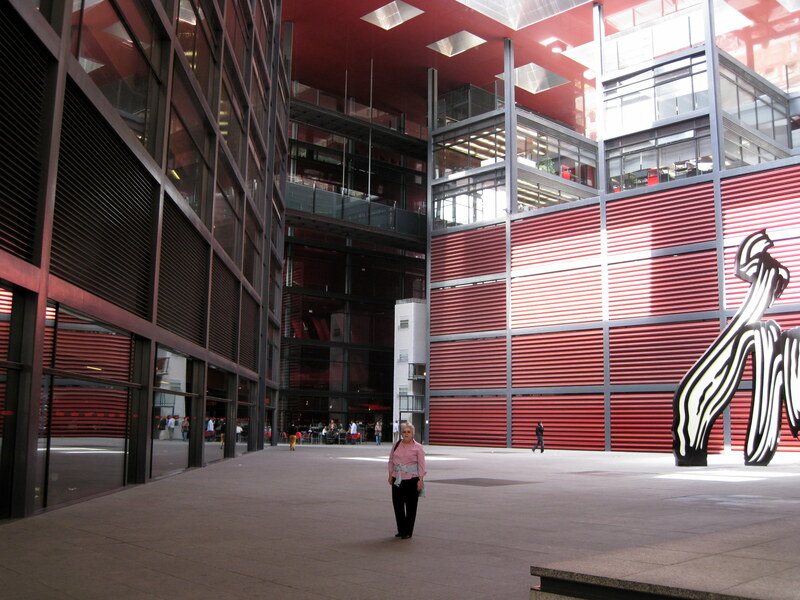 We started walking to the Centro de Arte Reina Sofia to see Picasso’s Guernica. The museum’s architecture is very modern and is an interesting contrast to our “usual Gothic”. We had to stand in line for a while to enter the Guernica gallery - until those who were already in there came out. We were first in line. When we came out there was a very, very long line waiting to get in. Guernica, now rests at this museum after a long and troubling history of traveling. Banned in Spain during Franco's era (Picasso refused to have it displayed here anyway), it hung until 1980 at New York's Museum of Modern Art. The fiercely antiwar painting immortalizes the shameful bombing of the town by the German Luftwaffe, fighting with Franco during the Spanish Civil War. Guernica was the cradle of the Basque nation, and Picasso's canvas made it a household name around the world. We went through several rooms and then to the roof where we had a good view of Madrid. 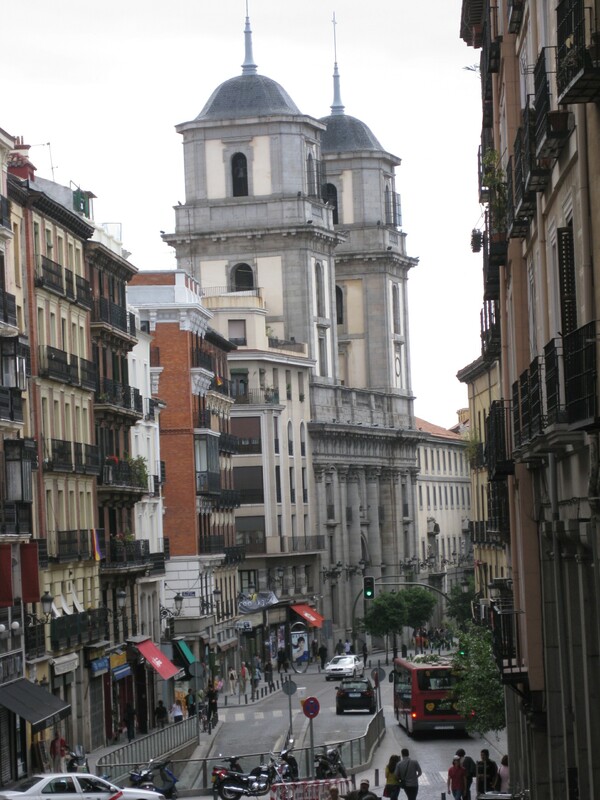 Then we walked several blocks to the Metro stop and took the Metro to Plaza Tirso de Molina in order to see San Isidro Church which was used as the cathedral from 1885 until Almudena Cathedral was finished in 1993, but it was closed. The church fit into the surrounding buildings and did not have much of a façade. We walked towards some other steeples but lost sight of them and came out on the Calee Mayor not far from the Plaza Major. The Almudena Cathedral was some distance from where we were so we decided to wait until tomorrow when we would see it on the Globus tour. As last night the waiters stand out in front of the various cafes on the Plaza Major with t heir menus. One was a little aggressive but the menu looked good. 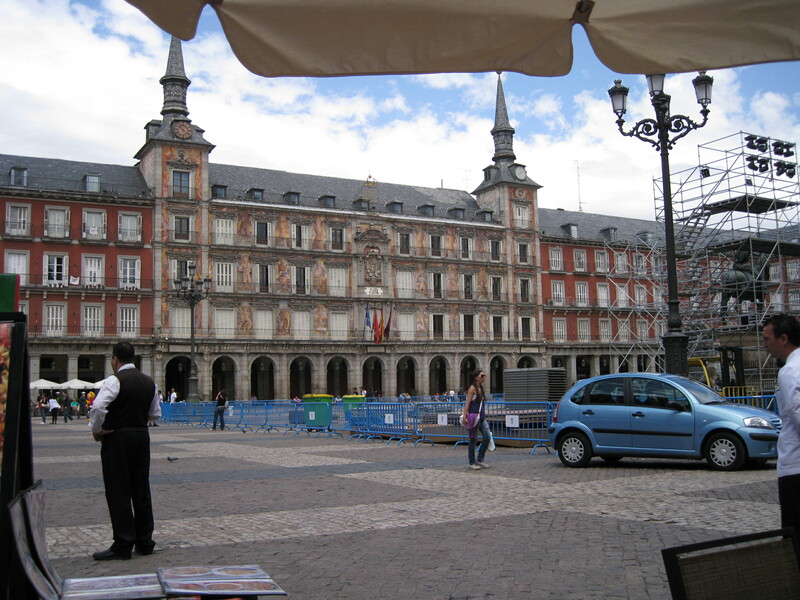 So we had lunch at Cafeteria Christina – once again eating in the Plaza Major. We ordered a pitcher of Sangria and two tapas- one shrimp, scallops, mussels in a vinaigrette and croquets jamon. The both were very good. Then we walked through the plaza and got some ice cream. 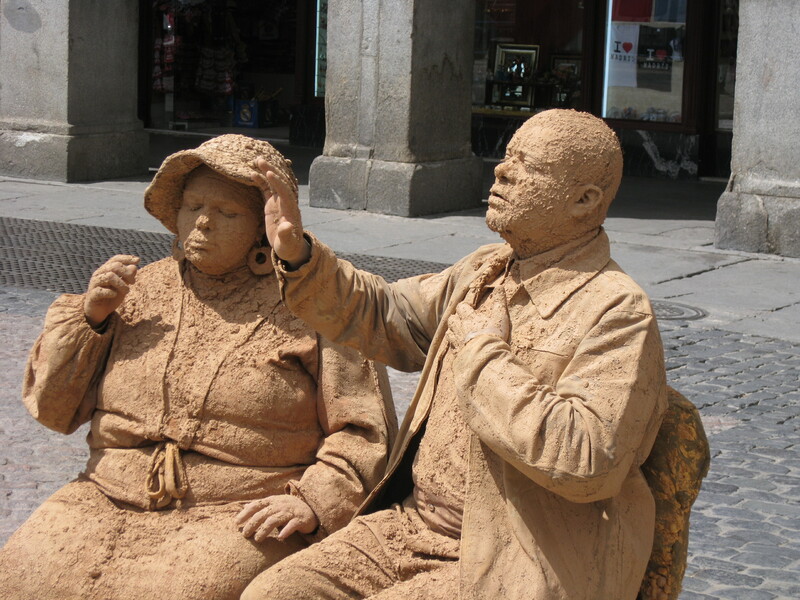 All around the plaza were street entertainers in various costumes standing like statues. Visitors have their picture taken with the statue and then put coins in a basket on the ground. Then we walked to the Puerto de Sole and caught the Metro back to the hotel. Our key card wouldn’t work. Woops! We went down to the desk and straightened it out. I guess, since we only were paying for one night, they thought we had left. We are now on the Globus tour account. They re-set the lock. At 6:00 we went to the tour meeting. There are 41 people from Virginia, Philadelphia, Atlanta, Phoenix, Canada, Australia. Our guide’s name is Kaye. She gave a good presentation. Everyone had to stand and give their first name and where they were from. There was time to mingle while drinking Sangria. Dinner was in the same room where breakfast was served. We had a large salad, chicken which was sort of dry, and French fries. We had a good frozen dessert. We were back in our room by 10:00. It looks like it is going to be fun group to travel with.